When you want to entertain in a pinch, quick & easy to use party accessories are a must to have on hand. Get the party start in a flash with Grandipity plastic disposable tablecovers! 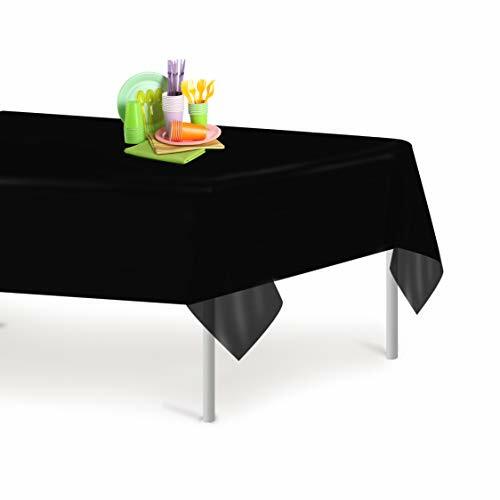 Ideal for covering buffet tables, this plastic tablecloth is also a great way to avoid hours of clean up after messy arts and crafts or painting projects! Available in a variety of colors and styles, you have a wide range of options to choose from to suit one that matches your specific needs! You never know when a cause for celebration will arise. That’s why our tablecloths are a great accessory to have on hand so you’re always party ready! PERFECT FIT: 54" x 108" - covers any table up to 8 ft. MULTIPLE PURPOSES: They're not just for parties! Having some friends over to paint your new home? Doing arts and crafts with your little ones? These tablecloths are a great way to line floors to catch messy spills! EASY CLEAN UP: These tablecloths are great at picking up any messy spills from food, drinks, paint from arts and crafts sessions and more! What's better? They're completely disposable so no need to worry about clean up! AVAILABLE IN DIFFERENT COLORS: Let your imagination run wild! These tablecloths come in a wide range of colors and styles to suit your particular mood so you can accommodate different party themes! QUANTITY PACKAGES: Save money by choosing a larger sized package. With 6 packs and 12 packs to choose from, you're sure to have your tables covered for just about any event that comes your way! If you have any questions about this product by Grandipity, contact us by completing and submitting the form below. If you are looking for a specif part number, please include it with your message.